Apps can help you make the most of Instagram by enabling additional functionality to make your profile stand out and make it easier for people to connect with you. These 4 apps will help you create a well balanced, organised Instagram account that will be appealing to potential connections and followers. Want to see what your Instagram posts will look like before they are published? Preview will let you drag and drop images to see what they look like and re-order them before you share. This is useful if you are planning an Instagram theme and want to optimise the look and feel. A well-ordered theme with consistent colours, patterns and filters will make your profile stand out and look professional. The preview app allows you to schedule posts and generates popular hashtags at no cost. The paid versions have additional features including re-post, advanced analytics, access to all filter packs and the account can be used by multiple users. Sometimes you see some content on someone else’s Instagram that is so good you want to share it to your own feed. Reposta is a free app to allow you t0 do this. To repost, click on the post menu (top right-hand corner of the post you want to share), then click on share link. Navigate to the Reposta app and the link will be copied in automatically (otherwise paste in the link), click on preview then share. The ratio of followers to non-followers can impact how visitors view your profile. Some insta’s will be disinclined to follow you back if you follow more accounts than follow you back. So Follow Cop can help you get your ratio of followers to following, back on track. There is a free version, or you can upgrade to the paid for more features, including mass unfollows (200 at a time) and no adverts. You will see a list of accounts that do not follow you with a “unfollow user” button next to each, so you can easily unfollow them. This can be done one at a time, and there are adverts that appear fairly often. With instagram you can’t add hyperlinks to posts – you can post the link text but you won’t be able to click on the text to go to a webpage. A visitor would need to copy and paste the link. There is one place for a hyperlink and this is on your Instagram bio. So, you will see Instagram posts with comments such as ‘check out this blog post – link in bio’. This is frustrating if you want visitors to have a choice of links to visit. Linktree can help with this. 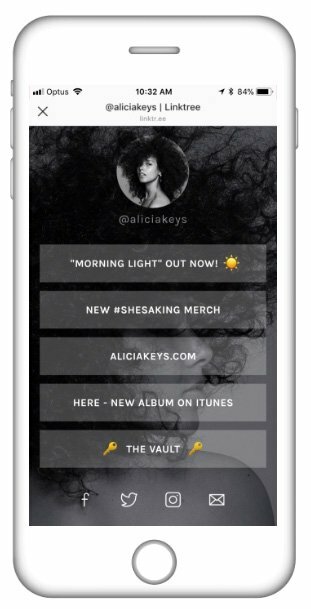 Linktree creates a unique URL that you can place in the bio of your Instagram account. This links to your ‘linktree’ which is essentially a list of links or buttons. Linktree provides a better experience for your profile visitors so they can go directly to the content that appeals most to them. What other apps would you recommend for Instagram? Get SEO Awesomness Delivered Straight To Your Inbox!